Maria Energia: The Sietch Blog: Solar the Answer to CA Heat Wave? The Sietch Blog: Solar the Answer to CA Heat Wave? Reprinted with permission from The Sietch Blog. Check out more of Shane's great work over there! If you live in southern California, you know one simple fact. It’s hot, really really, hot. With temperatures well over 100 degrees Fahrenheit in Los Angeles for the last couple days. As of Tuesday 14 people have died do to temperature related incidents. The California people suffering from this oppressive heat are doing what most people would do in situations like this, by cranking up the AC. This is putting a lot of strain on the utility grid, pushing it in some places to the breaking point. Utility crews are struggling to keep up with the massive drain on the system. Roughly 29,000 homes were without power at some point in the last week in 15 counties, including Los Angeles, Orange, Ventura, Riverside and San Bernardino counties. The heat and demand is causing equipment to break down, but as of yet they have not run out of power. But they are coming close. Power demand is hitting record levels. Last Friday, Southern California Edison, broke its peak energy demand record of 22,889 megawatts set July 25, 2006. Energy use peaked in the afternoon at 23,303 megawatts. So how do we get out of this problem? We have a couple of options, we could build more coal power plants, throw up a nuclear power plant and then worry what to do with the waste, or burn more natural gas or oil. Or we could look up and realize that the crushing heat could also be our ticket out of this problem. Nevada just turned on a massive 64mw concentrated solar thermal power plant. It uses the power of the sun to create energy at the exact time when it is needed most, in the mid afternoon when everyone comes home and flips on the TV, the AC, and the rest of the appliances that surround us. Providing power, when power is needed most. So often the utilities need an additional couple hundred megawatts of energy, in southern California this extra peak load power could easily be produced by concentrated solar thermal plants. With it's sunny skys and mild climate a whole series of these plants could do a lot more than even out the bumps, they could provide a significant amount of power. Besides concentrated solar thermal, photovoltaic panels, like the ones Google recently installed, could provide distributed generation on the roofs of millions of homes. This energy would drastically reduce the strain on the grid. Making the energy where it is needed most is also more efficient as the energy doesn’t have to travel miles and miles through power lines, transformers and substations. California has already started working on the problem. They have some of the most solar friendly policies in the country. Big box retailers like Walmart and Target have plans to blanket many of their stores in the region with solar. and others are following suit. California is working to harvest (some would say not quickly enough), but they are not the only ones facing heat waves and energy shortages. This summer states across the country have been experiencing record high temperatures. These summer peak loads could be abated country wide with the enactment of a strong federal policies to encourage people to install them (there are some), but they are small and could be much more extensive). 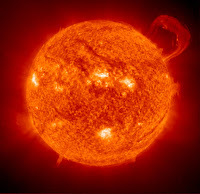 If the new reality of global warming is heat waves, and many more sunny days, we should take advantage of all that free energy streaming down from the sky. Perhaps you might want to contact your local congress person and let them know that you want your state to have a solar backup plan the next time a heat wave strikes.